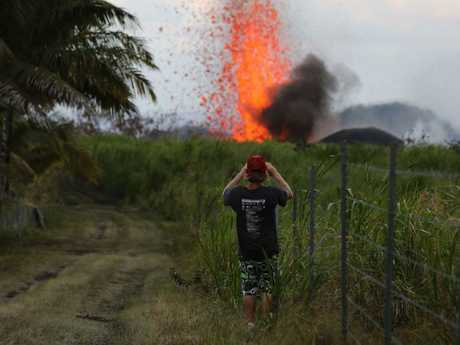 A MAN has suffered serious leg injuries after he was "lava bombed" by spatter from the active Kilauea volcano on Hawaii's Big Island. Lava has been oozing out of cracks in the volcano for two weeks and about 40 properties have been destroyed. 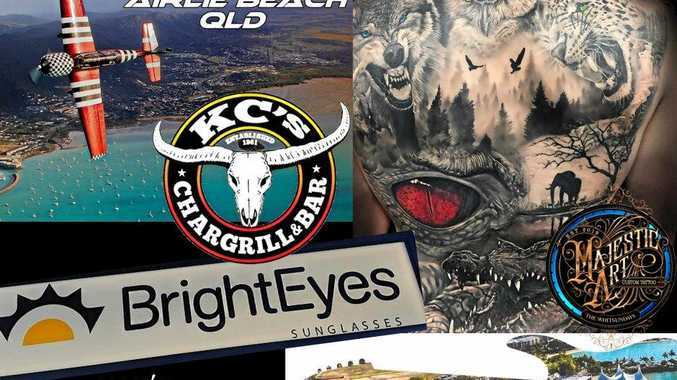 But one man became injured when he was sitting on his porch and a "lava bomb" struck him, Hawaiian Civil Defence Administrator Talmadge Magno confirmed. "I heard the injury was quite bad, serious to his leg," Mr Magno told the Star Advertiser. The man's name has not been released but he is believed to be in a stable condition in hospital. The latest reports on the active volcano indicate the lava has taken on new characteristics with fresh magma mixing with "decades-old" magma, sending a flow toward the ocean as well as other main arterial roads. Since the first fissure opened on May 3, lava has mostly spattered up and collected at the edges of the cracks in the ground. 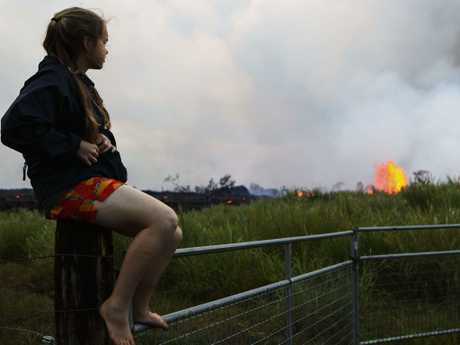 Two neighbourhoods with nearly 2000 people were forced to evacuate as lava claimed a large number of structures. A handful of people were trapped when lava crossed a road on Friday, local time, and some of them needed to be flown out. "They shouldn't be in that area," the local country's managing director Wil Okabe said. He wants people to heed evacuation warnings. "It was just a little crack in the ground, with a little lava coming out," he said. "Now it's a big crater that opened up where the small little crack in the ground was." Experts are uncertain about when the volcano might calm down. The recent change in the flow of lava, and perhaps an explanation for the occurrence of "lava bombs" is attributed to new magma mixing with 1955-era magma in the ground, creating hotter and more fluid flows, scientists said. 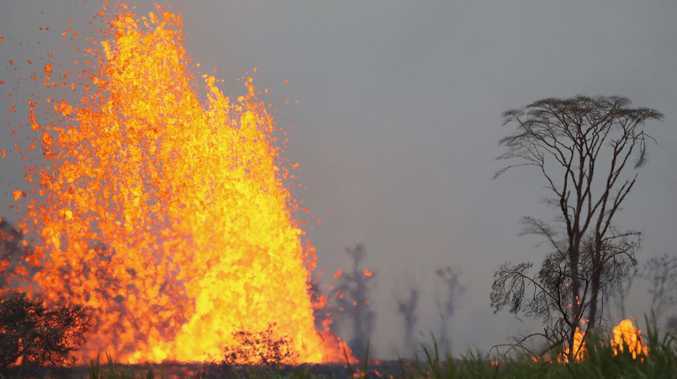 "There's much more stuff coming out of the ground and it's going to produce flows that move further away," said Wendy Stovall, a US Geological Survey volcanologist. By Saturday morning, two of 22 fissures had merged, creating a wide flow advancing at rates of up to 274m per hour. Aerial footage from the USGS showed fast-moving lava advancing to the southeast. The flow was 2.4km from the ocean, scientists said. In the background, the footage showed lava fountaining 100m high at one of the fissures. The fountains are created by vents closing, forcing magma to burst through a single outpoint, Stovall said. A lava flow was less than a kilometre away from Highway 137 and would reach it in a matter of hours, officials warned Saturday afternoon. No one lives in its path and another highway remained open as an escape route, said Hawaii County spokeswoman Janet Snyder. The Big Island volcano released a small explosion at its summit just before midnight Friday, sending an ash cloud 3048m into the sky. The USGS's Hawaiian Volcano Observatory said eruptions that create even minor amounts of ashfall could occur at any time. It came two weeks after the volcano began sending lava flows into neighbourhoods 40 kilometres to the east of the summit. Meanwhile, more explosive eruptions from the summit are possible. "We have no way of knowing whether this is really the beginning or toward the end of this eruption," said Tom Shea, a volcanologist at the University of Hawaii. "We're kind of all right now in this world of uncertainty." U.S. government scientists, however, are trying to pin down those signals "so we have a little better warning," said Wendy Stovall, a volcanologist with the observatory. The greatest ongoing hazard stems from the lava flows and the hot, toxic gases spewing from open fissure vents close to homes and critical infrastructure, said Charles Mandeville of the U.S. Geological Survey's volcano hazards program. Authorities have been measuring gases, including sulfur dioxide, rising in little puffs from open vents. The area affected by lava and ash is small compared to the Big Island, which is about 10400 sq km. Most of the island and the rest of the Hawaiian chain is unaffected by the volcanic activity on Kilauea.